Leadership is not the “man on horseback,” or the steely-eyed CEO. A career in the shadow world of espionage – and in the vast bureaucracy of the CIA – taught Mr. Carle that leadership is, at heart, a collegial enterprise in which being a peer and teammate is more important than taking the point, or knowing more, or being more decisive and hard-charging than anyone else. Mr. Carle will illustrate the life-changing moments that defined his career in the CIA, often working on counterterrorism operations around the world, and how an organization succeeds or fails by the leadership shown both in these high stakes moments and in day-to-day tasks, whether in a position of command or not. He will show that the challenges of leadership in espionage, whether in Afghanistan, or at a black site, are distilled, real-time life and death examples of the same challenges one faces as a corporate leader. He will show through examples of key moments in his and the Agency’s work that leadership comes down to putting your people before you, knowing how to identify and act upon the critical bit of information that makes action possible even though no answer is clear, and in living your institution’s principles, rather than commanding anyone or anything. Glenn Carle's last position was Deputy National Intelligence Officer for Transnational Threats (terrorism) on the National Intelligence Council. In this role he led the Intelligence Community in preparing the U.S. government's most senior assessments of threats to the U.S. for the President, members of his cabinet, military leaders, and other top officials. Glenn Carle worked extensively on terrorism, European issues, Balkan issues, notably Kosovo and Yugoslavia, the Sandinista-Contra War, and Cold War issues in Europe. Mr. Carle served on detail to the White House as a Trade Negotiator for the US Trade Representative, where he was the Director for European Free Trade Area Affairs, and the Deputy Director for Russian and Newly Independent State Affairs. He also served as a Trade Negotiator at the World Trade Organization in Geneva, responsible for Free Trade Association issues. Glenn Carle is the author of The Interrogator, which details his involvement in and opposition to the Enhanced Interrogation Program during the “War on Terror,” and having led for several months the interrogation of one of the top members of al-Qa'ida. The Interrogator has been called "the best and most truthful firsthand account of life inside the CIA ever published." 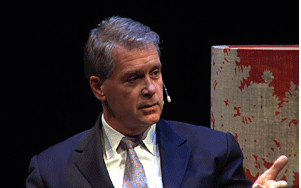 Glenn Carle has spoken around the world about “enhanced interrogation,” leadership and ethics, the “War on Terror,” and issues of national security. He has appeared frequently on major networks such as CNN, the PBS Newshour, NPR, the BBC, Al Jazeera, MSNBC, CBC, Fox, ABC, and ABC Australia, and has been profiled in numerous magazines, newspapers, and programs, such as The New York Times, The Boston Globe, The London Times, The Economist, Foreign Policy, The Wall Street Journal, Die Zeit, Bethesda Magazine, The Washington Post, The New Zealand Herald, Spiegel, and many others. Glenn Carle has spoken at the US Naval Academy, Harvard, Boston College, Tulane, the University of the Pacific, Brigham Young University, Simmons College, Ohio State University, the University of Mississippi, the University of Ottawa, the Young Presidents Organization, the Anti-Defamation League, Roxbury Latin High School, the Herzliya Conference in Israel, Corvinus University in Budapest, and many other institutions. His op-eds have appeared in publications such as the Washington Post, Huffington Post, Foreign Policy, the Daily Beast, Newsweek, the Harvard Crimson, and The Sydney Herald. Glenn Carle holds a BA in Government from Harvard, a Masters in European Studies and International Economics from Johns Hopkins University's School of Advanced International Studies, has done additional masters study in International Relations at the Institut d'études politiques de Paris, and received a Certificat d'études pratiques, in French Civilization, from the Université de Grenoble. Glenn Carle has taught at Boston University and served as a Fellow at Harvard University’s Kennedy School of Government. Thank you! It was very enlightening. Such a good speaker and talk. Very interesting! This talk was an entertaining flashback. I wholeheartedly agree with leadership training in conjunction with compassion being taught early. As a soldier, it was great to hear a similar perspective in a civilian workspace.